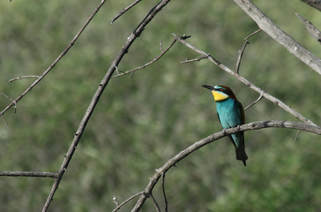 In May 2019 Peter and Liz Cowdrey are leading a six-night Birdsong and Music walking tour at Le Fontanelle, a lovely farmhouse in the Alpe della Luna overlooking the Tiber valley in South East Tuscany. The holiday is not designed for 'twitchers' - but for anyone who loves walking in beautiful landscapes filled with wild flowers, culture and history, all experienced with a birdsong and music bias, along with good local food and wine. 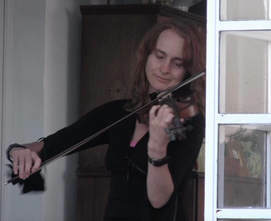 Peter is a world-renowned expert on birdsong as well as a composer and musician, and his sister Liz is a classical violinist noted for her electrifying performances of gypsy music, who can reproduce a variety of birdsongs on the violin. Lizzie Wingfield, host and one-time soprano, now turns her diva-skills towards cooking delicious meals using wonderful local ingredients. Walks are on well-worn paths in hilly terrain. Average walking time is about four hours a day, with variations available for the more or less energetic. There will be an optional dawn chorus walk. ​Le Fontanelle is close to the Cammino San Francesco, a pilgrim route following the steps of St Francis, and the hills are dotted with small, remote monasteries where he stayed, including La Verna where he received the stigmata. Some of them will feature in the walks. Nearby Sansepolcro was the birthplace of Piero della Francesca and several of his works are in the museum, including The Resurrection of Christ – the painting that caused the British army in WW2 to delay their advance up the Tiber valley to avoid risking destroying it. 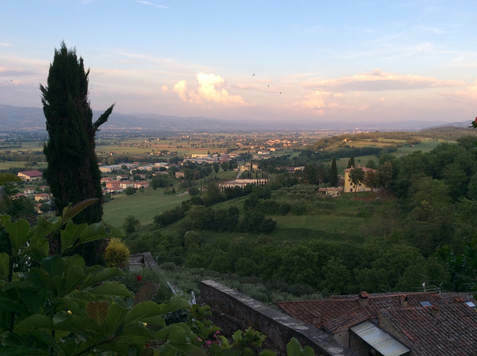 Nearby Caprese was birthplace to Michelangelo, and the beautiful hill town of Anghiari can be seen in the distance from the terrace. ​Each evening before dinner Peter and Liz perform a short serenade of music for violin and piano, taking advantage of the Steinway in Le Fontanelle's delightful music room. Repertoire covers baroque, gypsy, classical, Spanish, and Peter and Liz's own transcriptions of birdsongs. Birds recorded on a short visit in May 2018 included bee-eater, golden oriole, hoopoe, short-toed snake-eagle, subalpine warbler, sardinian warbler, red-backed shrike, firecrest and many nightingales and cuckoos. Both redstart and black redstart breed in the walls of Le Fontanelle. A variety of butterflies were noted including swallowtails. There was a spectacular display of wild flowers, including a number of different orchids. See the gallery below. Bed and breakfast for extra nights by negotiation. Cost: full board (including packed lunch), wine, walks and serenades is £800.00. Bookings are confirmed on receipt of a deposit of £270. Numbers are strictly limited in order to maximise the birdsong experience, so please book early. Not included: Optional meals out in local restaurants, flights, and travel from the airport to Le Fontanelle. Guests are responsible for their own travel to and from Le Fontanelle; lifts from Sansepolcro bus station can be organized by prior arrangement. All guests must have their own travel insurance. Airports: The nearest airport is Perugia, with Bologna, Florence and Pisa also within range.